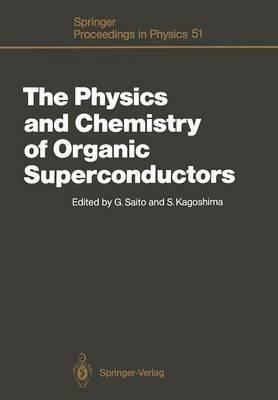 This volume contains the proceedings of the first ISSP International Symposium on the Physics and Chemistry of Organic Superconductors, which was held at the Komaba Eminence Hotel in Tokyo, August 28-30, 1989. This symposium was attended by 205 scientists from 12 countries. In total 106 papers were presented: 61 as posters, and 39 original papers and 6 review papers in oral sessions. Of these, 102 papers are included in these proceedings. These contributions cover the interdisciplinary field of physics and chemistry of organic superconductors with particular emphasis on the following subjects and materials: - superconducting properties, - spin density waves, - electronic and structural properties, - TMTSF salts and their derivatives, - BEDT -TTF salts and their derivatives, - metal coordinated organic conductors. The contributions to this volume are arranged in 11 categories. The Organizing Committee would like to acknowledge all participants, who contributed to the great success of this symposium on a growing field in both physics and chemistry. The editors express their gratitude to the members of the Organizing and Executive Committees for their cooperation. We also wish to thank Dr. H. Lotsch of Springer-Verlag for his management of the publication and Miss S. Shibata for her assistance in editing this volume. Illustrations note 44 Tables, black and white; XXII, 476 p.
I Organic Superconductors: Overview and Comparison with Oxide Superconductors.- Recent Developments in Organic Superconductors.- Trends in Structures and Properties of Organic and Inorganic Superconductors.- On Some Organic Conductors in the Light of Oxide Superconductors.- II Metal Coordinated Organic Conductors and Related Materials.- Conductive and Superconductive Coordination Compounds.- Synthesis and Properties of the New Molecular Metals Na[Ni(dmit)2]2 and NH4[Ni(dmit)2]2.- Effect of Counter Ions on Alkali Metal Salts of Mx[Ni(dmit)2] (M=Na, NH4...).- The Organic ?-Electron Metal System Interacting with Mixed-Valence Copper Ions (R1,R2-DCNQI)2Cu (DCNQI=N,N'-dicyanoquinonediimine; R1, R2=CH3, CH3O, Cl, Br).- Metallic DCNQI Salts: Influence of Oxygen, Alloying and Dimensionality.- Anomalous Temperature Dependence of the Resistivity of (DMeO-DCNQI)2Cu at High Pressure.- Reflectance Spectra of DCNQI Salts.- Optical Spectra of Highly Conducting Phthalocyanine Salts.- Preparation of Electroconducting Materials Containing Copper Compounds: A Copper Oxide with 1,3,4,6-Tetrathiapentalene-2,5-dione.- III TMTSF Family: Superconductivity and Spin Density Waves.- A Hidden Low-Temperature Phase in the Organic Conductor (TMTSF)2ReO4.- NMR Evidence for the Existence of 1D Paramagnons in Organic Conductors.- Long-Range Spin-Fluctuations and Superconductivity in the Quasi-One-Dimensional Hubbard Model.- Transport Properties of Impure Anisotropic Quasi-One-Dimensional Superconductors.- Some Recent Experiments on the Field Induced Spin Density Wave States in the Bechgaard Salts.- Phase Diagram of the Spin Density Waves Induced by the Magnetic Field in Organic Metals.- Spin Density Wave and Field Induced Spin Density Wave Transport.- Magnetothermodynamics and Magnetotransport in (TMTSF)2ClO4.- Quantized Hall Effect in Spin-Wave Phases of Two-Dimensional Conductors.- 1H Spin-Lattice Relaxation in the SDW State of (TMTSF)2PF6 Under Pressure.- Non-ohmic Electrical Transport in the Spin-Density Wave State of Organic Conductors.- IV BEDT-TTF Family: Superconductivity.- Superconductivity in BEDT-TTF Based Organic Metals: An Overview.- T-P Phase Diagram of ?-(ET)2I3.- "2K-Superconducting State" in the Organic Superconductor ?-(BEDT-TTF)2I3.- A Change of the Incommensurate Superstructure in the Organic Superconductor ?-(BEDT-TTF)2I3.- Effect of Annealing on the Superconductivity of ?-(BEDT-TTF)2I3.- Evolution of the "High-Tc" States at Ambient Pressure in ?-(BEDT-TTF)2I3.- Electrical Resistance and Upper Critical Field in the "2K-Superconducting State" of ?-(BEDT-TTF)2I3.- Bulk Superconductivity at Ambient Pressure in Polycrystalline Pressed Samples of Organic Metals.- An Ambient Pressure Organic Superconductor ?-(BEDT-TTF-h8 and -d8)2Cu(NCS)2 with Tc Higher than 10K.- Nuclear Spin-Lattice Relaxation in the Organic Superconductor (BEDT-TTF)2Cu(NCS)2: Measurements by the Field Cycling Technique.- Magnetic-Field Penetration Depth of (BEDT-TTF)2Cu(NCS)2 Determined by Complex Susceptibility.- Tunneling Spectroscopic Study of the Superconducting Gap of (BEDT-TTF)2Cu(NCS)2 Crystals.- STM Measurements of Superconducting Properties in ?-(BEDT-TTF)2Cu(NCS)2.- Effect of Tensile Stress on the Superconducting Transition Temperature in (BEDT-TTF)2Cu(NCS)2.- Highly Correlated Fermi Liquids in the High-Tc Organic Conductor ?-(BEDT-TTF)2Cu(NCS)2.- Electronic Properties of (BEDT-TTF)3Cl2*2H2O.- V BEDT-TTF Family: Fermiology and Related Subjects.- Galvanomagnetic Properties of the Organic Metals ?-(ET)2X: Magnetoresistance and Shubnikov-de Haas Oscillations.- The Fermi Surface in the Organic Superconductor ?-(BEDT-TTF)2IBr2.- On the Electronic Properties of ET2Cu(NCS)2 as well as of Some New Organic Salts.- Fermi Surface and Band Structure of ?-(BEDT-TTF)2Cu(NCS)2.- Fermi Surface and Thermoelectric Power of Two-Dimensional Organic Conductors.- Self-Consistent Band Structure and Fermi Surface for ?-(BEDT-TTF)2I3.- Anomalous Magneto-oscillation in ?-Type Crystals of (BEDT-TTF)2I3.- Nearly Complete Quantization in Quasi-Two-Dimensional Organic Superconductors.- High-Field Magnetotransport in the Organic Conductor (BEDT-TTF)2KHg(SCN)4.- Electronic Properties in (BEDT-TTF)2X: Magnetoresistance and Hall Effect.- VI DMET Salts and Their Families.- Physical Properties and Crystal Structures of DMET Superconductors and Conductors.- Superconductivity and Spin Density Waves in (DMET)2Au(CN)2.- Phase Transition of the Organic Metal (DMET)2Au(CN)2 at 180K.- Antiferromagnetic Transitions in (DMET)2X and (DMPT)2X.- Conducting and Superconducting Salts Based on MDTTTF, EDTTTF, VDTTTF, EDTDSDTF, MDTTTF, BMDTTTF, Pd(dmit)2, and Ni(dcit)2.- VII Crystal and Electronic Structures.- Structural Instabilities and Electronic Structures of Some Organic Conductors and Superconductors.- Structural and Physical Properties of (BEDT-TTF)2[KHg(SCN)4].- Importance of Weak Hydrogen Bonding C-H***Donor and C-H***Anion Interactions in Governing the Structural Properties of Organic Donors BEDT-TTF and BEDO-TTF and Their Charge-Transfer Salts.- Electronic Structure of ?-(BEDT-TTF)2I3 Studied by Positron Annihilation.- Pressure Dependence of the Transport Properties of ?-(BEDT-TTF)2Cu(NCS)2.- Anomalous Transport Behavior in ?-(BEDT-TTF)2Cu(NCS)2.- STM Study of (BEDT-TTF)2Cu(NCS)2 Surface.- Crystal Growth and Properties of (BEDT-TTF)2Cu(NCS)2.- Synthesis, Crystal Structure and Properties of (BEDT-TTF)3CuCl4*H2O.- Electronic Properties of Charge Transfer Complexes of BEDT-TTF and Related Donors with Transition Metal Halides.- Structural Electrical and Magnetic Properties of the (BEDT-TTF)4Ni(CN)4 Complex.- Crystal Structures and Electrical Conductivities of EDT-TTF Salts with TaF6?, AsF6?, PF6?, ReO4?, ClO4?, BF4?, Au(CN)2? and Ni(dmit)2n?.- A New Transformable Cation-Radical Salt (EPT)2I7.- Microwave Conductivity of the Phthalocyanine and Dicyanoquinonediimine Salts.- Electron-Molecular Vibration Coupling in Organic Superconductors.- Dynamics of Charged Domain Walls in Semiconducting Charge Transfer Compounds.- The Effect of Pressure on the High Magnetic Field Electronic Phase Transition in Graphite.- Ferro- and Antiferromagnetic Intermolecular Interactions of Organic Radicals, ?-Nitronyl Nitroxides.- VIII Structural Design of Organic Superconductors.- Structure-Property Correlations in the Design of Organic Metals and Superconductors: An Overview.- Organic Conductors and Superconductors Based on (BEDT-TTF)-Polyiodides.- Stoichiometry Control in Organic Metals.- Unusual Molecular Systems of Organic-Inorganic Character and Increased Architectural Complexity.- IX New Molecules and Materials.- Salts Derived from Bis(ethylenedioxa)tetrathiafulvalene ("BO").- New Cation-Radical Salts (ET)3CuCl4*H2O and (ET)2CuCl4 with Metallic and Semiconducting Properties.- New Organic Synthetic Metals Derived from BEDT-TTF, Ni(dsit)2 and BEDO-TTF.- Synthesis and Crystal Structures of Multi-Chalcogen TTF Derivatives and Conducting Organic Salts.- Preparation of Methylated BEDT-TTFs for Controlling Intermolecular S-S Contacts.- Preparation and Properties of Dimeric TTFs.- Preparation and Properties of p-Quinodimethane Analogues of Tetrathiafulvalene.- Syntheses and Physical Properties of Oligothiophene Charge-Transfer Complexes.- 3,3? :4,4?-Bis(thieno[2,3-b]thiophene) with an Isoelectronic Structure of Perylene.- Design of Organic Molecular Metals Based on New Multi-Stage Redox Systems in the Non-TTF Family: Peri-Condensed Weitz-Type Donors.- Conjugated Heteroquinonoid Isologues of TCNQ as Novel Electron Acceptors.- Design of Two-Dimensional Stacking Structures: Twin-Type Molecules and Steric Interaction of Axial Substituents.- New Molecular Conductors Based on Metal Complex Anions.- Conducting Evaporated Film of Pt2(CH3CS2)4I.- Electroactive Langmuir Blodgett Films of Tetrathiafulvalene Derivatives.- Physical Properties of Conductive Langmuir-Blodgett Films of Tridecylmethylammonium-Au(dmit)2 and Its Derivatives.- Polymerization of Diacetylenes in Liquid Crystal Phases and Its Application to the Preparation of High Spin Polydiacetylenes.- X Theory.- Novel Superconductivity from an Insulator.- Bethe Ansatz Wavefunction, Momentum Distribution and Spin Correlation in the One-Dimensional Strongly Correlated Hubbard Model.- New High-Temperature Cooper-Pairing Phase for Vibronic Superconductivity.- Examination of Pairing via Effective van der Waals Interaction in High-Temperature Superconductivity.- Reassessment of the Excitonic Mechanism of Little's Superconductivity.- Multi-Valence Resonance-Condensation Model: A Possible Novel and Universal Origin of Superconductivity.- Density Functional Theory for the New High-Temperature Superconducting Phase Transition.- Possible Role of Two-Dimensionality for the Enhancement of Superconducting Tc.- XI Summary.- New Developments That Emerged in the ISSP Symposium.- Index of Contributors. In this review of the rapidly expanding and interdisciplinary field of organic superconductors, the researchers most active in the field detail recent fundamental advances and look forward to the substantial developments expected in the next few years.